Gelegen nabij Lake Almanor in het historische timmerstadje Westwood, Californië - de thuisbasis van Babe en zijn Blue OX. en het begin van het Bizz Johnson-parcours. The Country Cottage is al jarenlang een favoriete vakantiebestemming en we kunnen het nu delen met anderen die dol zijn op het geweldige landschap van Noord-Californië. Het huis is in de stad op een groot volledig omheinde tuin. In de omgeving is de berg Meadows Reservior, Lake Almanor, Feather River, en Lassen Volcanic National Park. Meren, beken, kreken en rivieren zijn hier volop aanwezig. 'We hebben genoten van ons huis om in te verblijven, Westwood en de omgeving zijn inspirerend en rustgevend voor mij en mijn familie.' Kristina M.
'We hebben hier een geweldige vakantie gehad. De omgeving was spectaculair. We hebben genoten van de Country Cottage - zeer comfortabele accommodaties voor onze familie. We hopen terug te komen. ' Robert G.
'Bedankt dat je ons zo'n geweldige ervaring hebt gegeven om in je Westwood-huis te verblijven. We konden veel genieten in Lassen Park en de prachtige omliggende plaatsen. ' Jayanta D.
A warm and comfy house that invites memories of grandma. We highly recommend this neat, clean, spacious cottage. The yard had lots of romping room for our basset hounds and Carol and her husband are kind, wonderful folks who go the extra mile to make sure your stay is a comfortable one. Westwood is full of friendly, smiling people who don't hesitate to point visitors in the right direction. We will definitely be staying here again. This is a charming and rustic cottage that is nicely furnished and has a large outdoor patio. The kitchen is stocked with all the appliances you could need to cook up some great meals on your vacation. If you don't feel like cooking, there is also a great restaurant, Buffalo Chips, within walking distance (try the wings!). The landlord was friendly and easy to work with and the neighbors were also nice and helpful. The surrounding area is an outdoor paradise, where the Sierra Nevada and Cascade ranges meet. 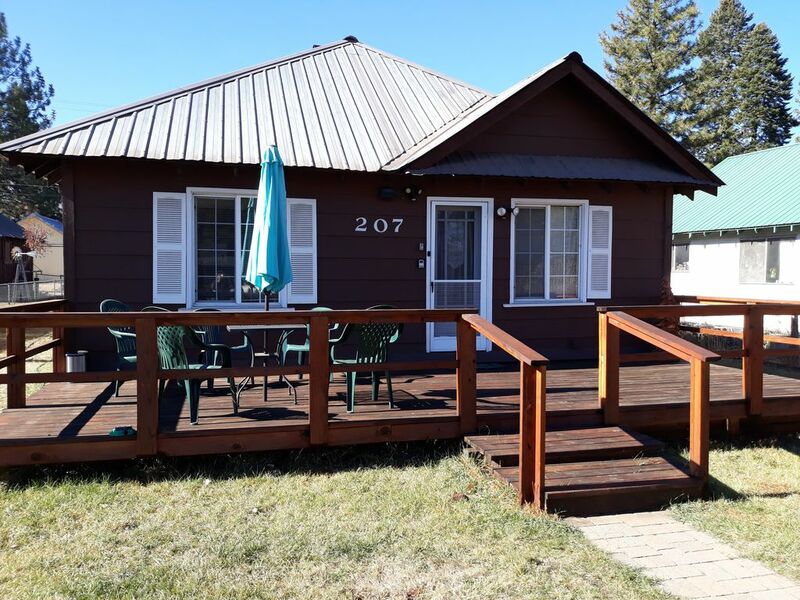 The rental is a great jumping off point to explore the Caribou Wilderness, Lassen Volcanic National Park, Lake Almanor and other nearby areas. A cozy, small town experience in the mountains. We had a relaxing 5 day stay here...fishing at numerous nearby sites , relaxing on the new spacious deck, and even got in a little target shooting at the gun range. The small town environment is especially what we like when traveling. I like to cook, and the kitchen has all I needed. Was clean, relaxing, and felt at home. The house was a rickety with uneven floors and walls separating from the ceiling, but the worst was the smell. It was so musty and moldy smelling that I had an allergy attack and had to find other accommodations after the first night. The water heater (with the overflow draining into the floor) which was in my bedroom made noise all night long. Not a restful night. The house is in dire need of repairs and upgrades if it is to be rented. As far as I’m concerned it was totally unsatisfactory. The rental was satisfactory from a cleanliness standpoint. The lady next door, Diane, who is responsible for looking after the property was helpful also. HOWEVER, the password for the WiFi was not correct and we had to use the neighbors WiFi (using her password was our idea, not the owner's) which was a weak signal and very disruptive in the business that I had to conduct while I was there. Furthermore, after we left the property the key was not left in the lock box, which was our error. However, the neighbor , again , Diane , had a key and the problem was solved as the key we should have left in the box was inside the rental. The owner of the house charged me $30 for this issue, which I do not agree with at all. I guess I should have asked for credit on my rent since the WiFi password was not correct, but that is not my style. In any case, I will not be renting this property again. I was disappointed as stated above. This very unfair, poor review is the direct result of the guest being charged $30 for not leaving the keys in the front door lock so the ext guests could gain access. My instructions explicity state that any failure to leave access for the next guests will result a charge. Although we did eventually get the new guests in it was a very stressful situation as we were traveling at the time. The wifi key he was given was the correct one and had been working all along. It was the same one the cable company had and when I paid for the technician to come out he didn't know why it failed either. He ended up bypassing it. The guest used the neighbors wifi ( til our was back up) and by his own admission made thousands of dollars doing so but begrudged me the $30 fee for failure to leave access for the next guests. Everything that could have been done was done My response was immediate so leaving me such a poor review is as I stated above unduly unfair. The personal items left in the home was carefully collected and held til another family member could retrieve some weeks later. Gelegen tussen Chester en Susanville, heeft deze historische oude houthakkersstad talloze plekken om zowel in de stad als in de omgeving te verkennen. Het plaatselijke museum, de loacl honey mead operatie, de Bizz Johnson trail head, de lay-out van de straten elk genoemd naar een boomsoort. visgebieden zijn overal om je heen. Hiken en het verkennen van de prachtige meren, beekjes etc. Andere activiteiten: Een dagtocht naar Lassen Volcanic National Park is zeker aan te bevelen. Aan de achterkant van het park liggen enkele vulkanische lavagrotten. Een zeer interessante ervaring om doorheen te lopen in totale duisternis. Normal cleaning is $50. However if a larger group of people or situation requires you will be charged the hourly rate I am charged.